I’m an amateur gardener. With my modestly green thumb, I have encouraged more than a few species of plants to grow relatively well in my yard. Through careful study and an investment in trial and error (read: I’ve killed my share of plants over the years), my garden looks fairly decent in most seasons of the year. 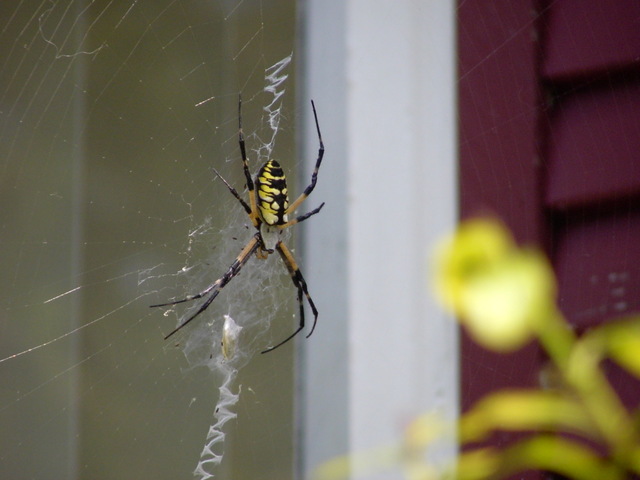 In August, I noticed a rather large garden spider – at least 3” from tip to tip — just outside my office window, in a delicate web spun artfully between a morning glory vine and the windowsill. It became a habit to check on my unintentional spider friend and its web each morning as I sipped strong coffee and checked emails at the beginning of my workday. Partly because I was curious about the spider and what it might snare in its web, and partly because I wanted to keep an eye on its whereabouts, lest it attempt to infiltrate the house! As Richmonders collectively exalted in the weather turning a bit cooler last week, I noticed a change in my “pet” arachnid. Apparently “it” was in fact a she, and on Tuesday she produced a rather large and elaborate egg case, the size of which was downright astonishing in relation to her body size. If I was pressed to extrapolate the feat into human proportions, I would say it was like a human mother producing a creature roughly the size of a 12-year-old. As I said, it was an impressive feat. However, instead of reveling in her accomplishment as a human might, my spider friend didn’t look very well at all. Her body mass shrunk significantly after the egg case was produced, and she was exhibiting signs of postpartum depression and lethargy. She didn’t weave her beautiful web on Tuesday night as she had each night since I noticed her, and on Wednesday she sat motionless on the webbing she had carefully wrapped around her egg case, in the corner of my windowsill. She was clearly tired from her accomplishment, and who could blame her? But I was surprised that she hadn’t moved all day, and wondered how she would eat if she spun no web. On Thursday morning when I looked out the window, she was gone. Vanished. Not a trace of her, and I even went outside and tentatively searched below the windowsill to see if I could find her earthly remains. All that’s left of her existence is an oval-shaped, ¾-inch diameter egg case. It seems she literally laid her eggs, did her best to ensure the continuation of her genetic line by positioning the egg case in a safe, warm corner where she had enjoyed bountiful hunting all summer – and then died. I must interject at this point that I am not in any way a fan of spiders, unless you count University of Richmond Spider athletics, but I couldn’t help but feel a twinge of true sympathy and utmost respect for this courageous arachnid who spun her web into a tiny corner of my heart. The Type-A housekeeper in me wants to clear that egg case off my windowsill post-haste. However, the first-grader in me still remembers how I cried when Charlotte — the nimble speller in E.B. White’s novel Charlotte’s Web — died after spending her summer creatively weaving her web with words such as “Some Pig” and “Terrific” to save her pig pal Wilbur from the butcher. I remember the tears as Mrs. Phillips read that touching chapter aloud to our class of six- and seven-year-olds at Maybeury Elementary School; we were all moved by the harsh reality of the spider circle of life. With such a vivid memory tugging at me, I can’t bring myself to destroy the elegant egg case on my windowsill. All these years and experiences later, here I sit, wondering how best to proceed with the spider egg case on my windowsill. I might just have to leave it alone and find out if any of “my Charlotte’s” progeny live up to her exemplary model of motherhood when they camp outside my window next summer.